Spring is around the corner and so is more daylight. NOTE: Hikes listed are linked to their details page only after they’ve been updated with the correct information. The LATH Digital Team keeps you updated on upcoming LATH hikes/events, provide outdoor news/updates, share fun pictures, and help answer your hiking or LATH questions. So make sure you connect with us online! 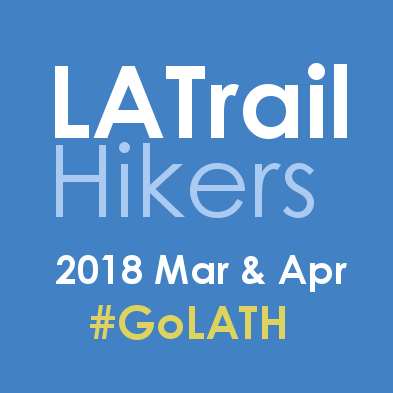 If you take pictures on our hikes, don’t forget to tag your LATH hike posts, photos, and updates with #GoLATH or #LATrailHikers to show others what it’s like to be out with our group! We’re actively looking for more great people to be part of LATH Hike Lead team. So, if you’re interested in having us consider, make sure you submit your interest form to let us know that you want to be part of our awesome group of hike leads. Or, if you’re interested in helping us out on the social front, we’ll also be looking for new members to join the LATH Digital Team. If you follow us on one of our social media accounts, send us a message letting us know you want to join our LATH Digital Team. We need some great LATH volunteers to keep us going strong! HIKE CANCELLATION NOTE: Should any hike need to be canceled (due to heavy rain or other reasons), we’ll try to post on our website’s hike’s detail page and on our Facebook page, about 1 .5 hours prior to the meeting point, so you are aware. Otherwise, the hike is considered a go. – Weekend hikes are primarily in the morning unless otherwise indicated. – All hikes are subject to change, cancellation or other modifications. We may even add in additional hikes that may not appear on the original listing. – We try to schedule 2 months worth of hikes so we always have a fresh new set every so often. – All hikes listed are pre-scouted by our Hike Leads prior to taking the group. – We require that you bring water to any of our hikes. HOW DO I PARTICIPATE WITH THE GROUP ON THESE HIKES? 1. Read the details page for the hike you’re interested in. 2. Make sure that the Hike Level accommodates your hiking experience (1 easiest, 10 most strenuous). 3. If, and only if it suits you, then show up the day of the hike with all necessary gear, nutrition, and water (we mention everything you need on each details page per hike). 4. (Optional): RSVP via Facebook so we know you’re going. It also let’s us know what about how many hikers will be attending. DISCLAIMER: LA Trail Hikers and its Leads/Organizers/Volunteers/Participants do not take responsibility for any harm, bodily injury, accidents, or damage to personal property. By clicking “Attending,” or attending the hike, you confirming that you understand that all outdoor activity such as hiking, backpacking, and trekking have an associated danger, and will not hold any hike lead/organizer, participant, LA Trail Hikers, or any group associated pet responsible for any hazard to your well being. Additionally, you will not be allowed to participate with the group if you are not adequately prepared with enough water and the right gear/equipment/nutrition essential to complete the hike. You are fully responsible for yourself.